Below are the five best time management techniques to ensure that you have a successful business. Businessmen and entrepreneurs have to do various tasks and many assignments. They have to handle many things at a time. Bookkeeping and accounting are cumbersome jobs they must handle. The best way to manage all of this is to make lists of all tasks and items you have to handle. Making lists is part of all time management techniques. Lists can be memorized and used accordingly to prioritize if you have an outstanding memory. So, the best solution for time management is to enlist and write down all tasks, to do lists, and pending assignments. Annual schedule: Prepare the schedule for one year. This schedule is based on daily activities. Things to do list: make the list of things to do on a daily, weekly and monthly basis. All things to do tasks should be prioritized according to urgency. People to call list: enlist all phone numbers you have to make phone calls. This is the alphabetically prioritized list. Alphabetical priority means that you allocate an alphabet to each number you have call according to priority. A, B, C and so on as the priority goes down. Planner for the conference: planning of meetings and conversations you frequently need to have should be enlisted according to priority. This way, you don’t ever forget an important point or meeting. An easy and well-organized system for making lists on a regular basis should be adopted. The habit of making lists is worth using for business success. The more lazy and casual you become in organizing lists, the less will be your earnings. A tickler file system is used to manage daily files and activities in an organized manner. It serves as a booster for automatic memory and lessens the mess of daily files, workload, and activities. A tickler file is also known as a 43 folders system. It is a system in which files are arranged date wise in such a way that on the specific date that file will automatically be highlighted. A tickler file is a very simple and friendly system. Suppose you have 90 files of three colors, 30 for each month. You numbered them 1-30 for each month and allocate them in three different colors i. e. Blue for the current month, red for the next month and green for the month after that. Now you have a task that you need to perform on the 22nd of the next month. You put the note and other details on the 22nd number red file. On the 22nd of the next month, that file will automatically remind you of that task by popping up. This is an automatic reminder system. By using these tickle files, none of your tasks are missed or forgotten. A lot of time is saved and timely reminders lead to business success. In cell phones and computers, this pop-up reminder system can also be used. Lengthy meetings are just wastage of time. No work is done in the meetings. For unmotivated people, it is a hideout place where they can relax. 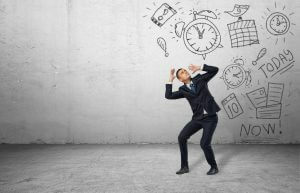 To have better time management, the frequency and duration of the time should be shortened. Meetings should be focused and something valuable should be accomplished in the meetings. Minimizing the meetings should be a good time management technique to have a successful business. Most of the time of a year should be pre-assigned and blocked to get maximum advantages. Assign your time to important tasks like bookkeeping, audit, payrolls, training, etc to succeed in the business. The time you get while waiting for something is valuable time. Spend that time in reading, thinking and listening. Responding to missed calls and messages during this time is not a good idea because you cannot concentrate and you normally do it in a hurry. The key to success in any business is a disciplined time management system. With these 5 techniques, you can be a pro in handling your time. Now, go get ’em tiger!